* After a week (7 days) of rental, add $5.00 per day for the next 7-days. On the third week of rental, add $2.50 a day for the next two consecutive weeks. 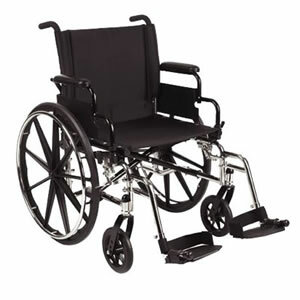 The Heavy Duty wheelchair is designed for individuals who demand an extra wide, heavy-duty or tall chair with seat-to-floor heights ranging from hemi through tall. The high-performance provides a 400-lb. weight capacity.